The School of Politics and International Relations is very happy to announce that it is on its way to create a New Undergraduate Dual Degree with Vietnam National University (VNU) in Hanoi. The project’s title is Internationalising Education for Greater Employability: Developing a Dual Degree between the University of Nottingham and Vietnam National University in Hanoi. This project is made possible thanks to the British Council, our own University, and IAPS, the Institute for Asia-Pacific Studies. Our partners, Prof. Pham Quang Minh, Rector of University of Social Sciences and Humanities, and Luong Ngoc Vinh, the Deputy Director of Cooperation and Development at VNU Hanoi, visited our campus in March 2017. They met Prof. Nick Miles, OBE, Pro-Vice Chancellor for Global Engagement at the University of Nottingham, and Prof. Michele Clarke, Associate Pro Vice Chancellor (Global Engagement) for Asia-Pacific. They also met Helen Foster, who is the Associate Director of the International Office, responsible for policy on teaching partnership development, and Professor Wyn Rees, the Head of the School of Politics and International Relations. 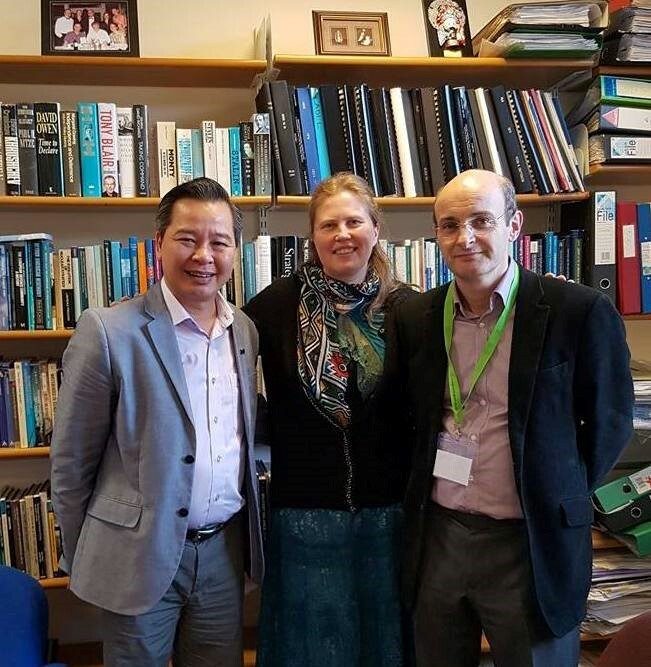 Our partners had a meeting with Prof. Katharine Adeney, Director of the Institute for Asia Pacific Studies, Prof. Neville Wylie, Associate Pro Vice Chancellor for Global Engagement (Americas), and Dr Catherine Gegout, the Principal Investigator of the project. Steve Vaccarini, the Senior Administrator for Placements, Partnerships and Mobility, was there to introduce the possibilities for student to do placements while they study at Nottingham. Prof. Pham Quang Minh, Rector of University of Social Sciences and Humanities, Vietnam National University, Hanoi, Dr Catherine Gegout, Project Coordinator, and Prof. Wyn Rees – Director of the School of Politics and International Relations, University of Nottingham. Both partners identified two possible dual degree programmes: 2+2 (two years in VNU, followed by two years at University of Nottingham); or 3+2 for Vietnamese students who need an extra year to enhance their English skills (three years in VNU, followed by two years at University of Nottingham). During their time at the University of Nottingham, VNU students will be given the opportunity to apply for the internship scheme of the School of Politics and International Relations. Vietnamese students will be able to attend the Centre for English Language Education (CELE) at the University of Nottingham to bring their IELTS scores from 5.5 to 6.5. In addition, members of staff from VNU are welcome to come and conduct research (with no fee) at the University of Nottingham for up to a period of six months. Both partners also want to focus on future projects. The first project would relate to teaching, such as training PhD students, and enabling the exchange of students. The second project would relate to research. 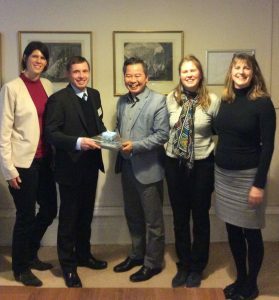 Prof. Katharine Adeney – Director of the Institute for Asia Pacific Studies, Prof. Neville Wylie – Vice President in charge of cooperation with America, Prof. Pham Quang Minh, Rector of University of Social Sciences and Humanities, Vietnam National University, Hanoi, Dr Catherine Gegout- Principal Investigator, and Helen Foster, Deputy Director, International Cooperation, University of Nottingham.